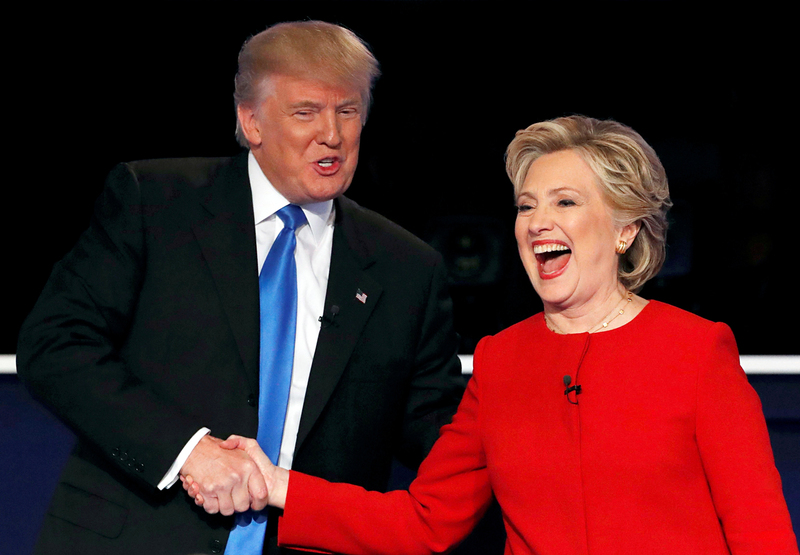 Republican U.S. presidential nominee Donald Trump shakes hands with Democratic U.S. presidential nominee Hillary Clinton at the conclusion of their first presidential debate at Hofstra University in Hempstead, New York, U.S., September 26, 2016. As the citizens of the U.S. vote on a successor to President Barack Obama, Russia tries to understand the inner selves of Donald Trump and Hillary Clinton in an attempt to see how well the newly elected president will get along with Vladimir Putin. On the eve of what some have called the most important elections in U.S. history, a group of Russian analysts gathered in the center of Moscow to break down characters of the candidates, one of whom will soon become the next president of the United States. The experts presented a report prepared by the Foreign Policy Advisory Group, a Moscow-based intelligence and research organization that does consulting services in the field of international affairs. The report titled “The next U.S. President: Professional profiles of Hillary Clinton and Donald Trump” tried, in part, to sketch a psychological profile of the two candidates and explain what traits attract people around the world, not only Stateside, to the personalities of these two utterly different characters. Quiz: Can you tell the difference between Vladimir Putin and Donald Trump? “His speeches are full of errors, he speaks brusquely, often dropping one thought for another, but this very manner has proved key to his popularity,” said Olga Rebro, an analyst in the Foreign Policy Advisory Group, trying to explain the way Donald Trump has charmed a substantial part of the audience in the U.S. but also in other countries. According to the expert, a continuous rivalry between a disciplined and a chaotic Trump characterized the rocky campaign path trodden by the scandalous candidate. This is why criticism of Trump’s “emotional immaturity” worked well for much more restrained and emotionally reserved Clinton. “During the final stage, when he [Trump] faced Clinton one -on-one, his emotions hampered [him],” said Rebro. According to the psychological profile drawn, Trump’s character combines a developed sense of intuition and abrupt impetuosity with a desire to be more pragmatic, a trait that surfaced the most in the latter stages of his campaign. “Trump may not be as smart as he says he is, but he is definitely smarter than many think of him,” concluded Rebro. In contrast to her political rival, Hillary Clinton appears, to the Russian experts, to be a more knowledgeable candidate. “Clinton is an intellectual. She meticulously works through all points of her political agenda,” said Andrei Sushentsov, director and senior associate at the Foreign Policy Advisory Group and associate professor at the Moscow State Institute of International Relations (MGIMO). The experts assessed that Clinton’s camp had tried to construct an image of a politically correct woman who listens, understands, and acts on her audience’s preferences, instead of imposing her own vision for the U.S.’s future on her audience. As is the case with Trump, Clinton’s strength is also her weakness, according to the experts. “Hillary chooses her words very carefully. Her public speeches appear artificial at times,” said Sushentsov, underlying the absence of improvisation and lack of inspiration in Clinton’s public speeches delivered during the current campaign. During her 2008 campaign against Barack Obama, Clinton approached the debates with humor and an appropriate degree of spontaneity. “She was talking brightly, appealing to people’s hearts,” said Sushentsov. According to the expert, those who remember how Clinton appeared in 2008 may fail to see the same visionary person today. “When a man plays chess with a machine, the machine always wins. But in this battle, people’s sympathies are always with the man. Do you understand who is the machine?” said Andrei Bezrukov, a former Russian agent who served undercover in the U.S. and who currently serves as advisor to the president of Russia’s largest oil company Rosneft and lectures at MGIMO. Trump’s phenomenal popularity among the Russian audience may be accounted for by his disdain for the pervasive political correctness so sternly executed by Clinton, said Bezrukov. “Political correctness still does not exist in our country and will probably never be established [in the same form as in the U.S.]. Trump behaves like a reckless man and this may well be what [a part of Russian audience] finds attractive,” said Bezrukov. Whoever claims the Oval Office, the new U.S. leader will inevitably have to establish a contact with Russian President Vladimir Putin and development of this new kinship may be a rather intriguing thing to watch. “Personal contact is an important part in establishing intergovernmental relations for our president [Putin],” said Sushentsov, explaining that friendly relations between Putin and leaders of other states quite often, though not always, translate into constructive relations between Russia and the country in question. Sushentsov pointed out the very first meeting between Putin and Barack Obama at Putin’s Novo-Ogarevo residence near Moscow. “Putin and Obama were trying to establish this interpersonal contact at their first meeting, when Putin was trying to appear more intelligent and subtle than he actually is and Obama was trying to look more masculine than he is,” said Sushentsov. It is widely believed that this meeting never grew into a lasting affinity between the two men, even thought experts highlighted that the reasons for the current drawback in Russia-U.S. relations are primarily structural and not personal. At the same time, experts believe that Putin would get along with Trump rather well even despite the differences in their upbringings and life experiences. “It will be harder with Clinton; neither she nor Vladimir Putin will seek to establish any meaningful relationships with each other,” said Sushentsov.